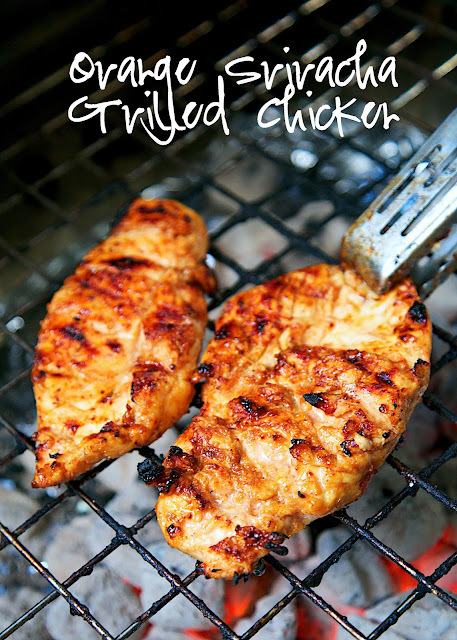 Orange Sriracha Grilled Chicken Recipe - chicken marinated in bbq sauce, mustard, Sriracha, honey and orange juice. Sweet, smokey and a tad bit spicy. SO good! Tons of great flavor and super juicy. We doubled the recipe for leftovers. We are always grilling this time of year. We grilled a ton last weekend for the 4th of July. We made this chicken over the weekend and fell in love with it. It has tons of great flavors - orange juice, Sriracha, dijon mustard, honey, and BBQ sauce. It was sweet, smokey and a tad bit spicy. Even though this chicken has a 1/4 cup of Sriracha, we didn't think it was spicy. I might actually increase the Sriracha next time, but I like spicy food. 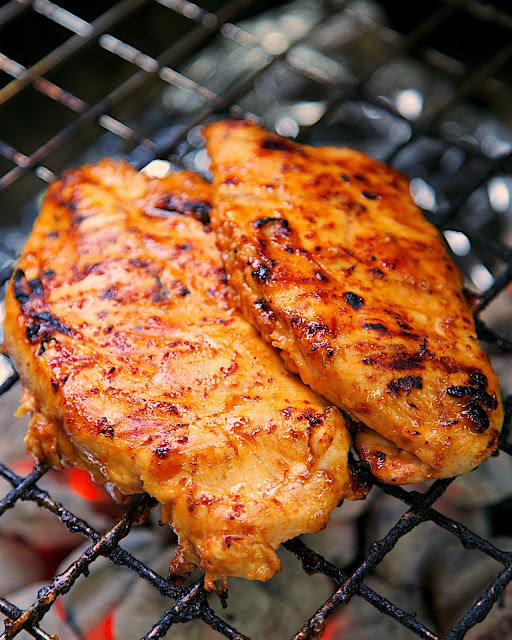 We let the chicken hang out all day in the marinade so it could soak up the great flavors. This was really great and super simple. Make it this weekend, I promise you will love it too! Whisk together BBQ sauce, Sriracha, honey, mustard and orange juice. Pour over chicken and refrigerate a few hours up to overnight. Think I'll try this with pineapple juice instead of orange & grill pineapple rings on the side. that is a great idea!! I will have to try that next time. I don't see why not. Let us know how it turns out if you try it. I don't have pineapple or oj at the moment. What would an alternative liquid be that would work? Maybe lime? I've only made it with orange juice, so I don't know how it will turn out. on a scale of 1-10, 10 being the spiciest, how spicy would you rate this recipe?